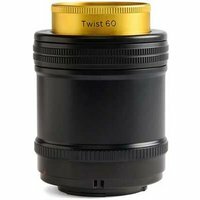 The Lensbaby Twist 60 Optic with classic metal-bodied, Petzval design is a 60mm lens with bright f2.5 aperture that creates a dreamy, swirly bokeh background with subtle vignetting in the corners for a timeless, vintage effect. True to an 1840 design by Joseph Petzval, this lens reveals striking separation between subjects and their background, making it well suited to portraits. This lens is for use with Sony's full-frame E-mount mirrorless cameras.